I'm trying to figure out how I have made it this far along in recovery and not written about perfectionism. Just in the past week alone, I have caught myself multiple times thinking, "When I was in my eating disorder, I had to be perfect at that. Now that I'm in recovery, however, I constantly feel like I need to be perfect at recovering. It's like a no-win situation." Seeing that written out makes me realize how ridiculous that sounds, but those thoughts still weigh heavily in my mind. Perfectionism is something that has haunted my every move for as long as I can remember. Those "not good enough" thoughts are in direct relation to this need to constantly excel. 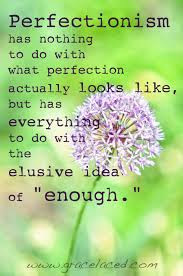 From what I have seen and learned, perfectionism is an extremely common trait among those of us with eating disorders. Instead of writing a novel about this subject (because I easily could), I found this quote that says everything I need to say about perfectionism. "Assuming failure is a self-fulfilling prophecy. we don’t try very hard. as well as it could have had we believed in ourselves. making our fear of failure a reality. we have to be okay with making mistakes and being imperfect. even the most talented people mess up. Failing at something doesn’t mean making mistakes. It doesn’t mean faltering or falling down. As long as you keep getting back up. and honoring what you’re passionate about. My hope is that this quote resonates with all of my fellow perfectionists as much as it does with me. Although I try, I am nowhere near perfect in my recovery; however, I'm starting to realize that my mistakes don't make me failure. I just stole that quote! Haha I'm glad - steal away! It took me awhile to figure this out lol.... You are the biggest perfectionist I've ever met. I am married to a perfectionist and am mother to two perfectionists, and I suppose there are some perfectionist tendencies in me, too (understatement?). Teaching our kids that mistakes do not equate failure is so important. Every time I get to encourage them in something, I realize how much I still need to hear that message, too. When I feel inadequate, I often freeze up and berate myself. It is easy to offer wisdom and harder to let it sink into our own hearts sometimes. Learning how to struggle, how to persevere, how to change course in order to succeed, are lessons we learn by doing them! Not one single person is perfect. I have learned to fall back on God's grace every time I fall down. Grace lifts me up again so I can get back on course. Press on! !